As these two awareness weeks coincide, it makes sense to focus on aromatherapy and massage treatments for clients with diabetes. Aromatherapists would never claim to treat diabetes and clients receiving complementary therapies should continue to use their medication as prescribed by their doctor. Interestingly though, I had one client with type I diabetes, who had a nifty gadget, which measured her blood glucose levels and pumped insulin into her as necessary. She came to me mainly for her muscular aches and stress. However, I was interested to use oils which are reputed to help balance blood glucose levels. 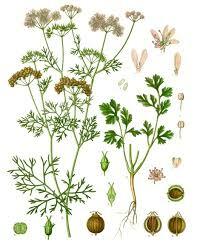 The main oils which seemed to suit this client, in view of her concurrent medical conditions, were lemon, geranium and coriander (depicted here). I also used black pepper oil to aid her circulation and infused comfrey oil for her psoriasis. Massage was tailored to suit her needs on the day. After a few sessions, she unexpectedly told me that her blood glucose levels had become more stable (as displayed quantitatively on her magic pump) and that she therefore needed less frequent insulin boosts. The exact cause of this finding is uncertain: perhaps an effect of the oils on her hormones, and/or the overall effect of massage and aromatherapy in reducing her stress levels. Either way, I was gratified by this unexpected positive outcome. A colleague of mine is currently completing her undergraduate dissertation on massage for clients with diabetes and I very much look forward to hearing about her findings.